If there’s one Food Truck you’re going to find kids pointing at and harassing their parents to eat from it’s Monster Burgers. There’s something very attractive about the graphics and colors on this food truck but the attraction doesn’t end there. Diana & Julio, the folks behind Monster Burgers made me believe in Colombian Fast Food again. If you’re not familiar with the Colombian Fast Food movement, you’ve probably chosen to overlook it. It’s all over South Florida and like anything that starts out as good, a bunch of inferior restaurants infiltrated on the second wave with horrible food. There are a couple of clues that will let you know you’re at a Colombian Fast Food Spot. Look for food with lots of Sauces, crushed Potato Chips and you’ve probably hit the jackpot, fingers crossed it’s a great one. Monster Burgers does a great job representing Colombian Fast Food. Sure, you can order everything plain but it would defeat the purpose of eating here. The Monster Hot Dog with its Bacon, Onions, Mozzarella Cheese, Crushed Chips and Sauces is always a winner. If you wanna go next level then get the Choridog which replaces the Hot Dog for a Sausage. And don’t get me started on those Salchipapas Criollas (Potatoes, Sausages & Sauces), you will not want to share them. If the Maicito is on the specials menu order two, one for now and one for later. A Maicito may sound like a weird dish to you if you’ve never had it. It’s Corn Kernels topped with Mozzarella Cheese, Crushed Potato Chips, Pineapple Sauce, Cream Sauce & you can choose to add Chicken and/or Bacon also. I know, crazy but crazy good. The Burger is over the top in excesses with everything but the kitchen sink thrown in. I don’t eat these too often as one of the Monster Burgers will put you down for the count. As I’m writing this I realized that I’ve never ordered the Chicken Burger. 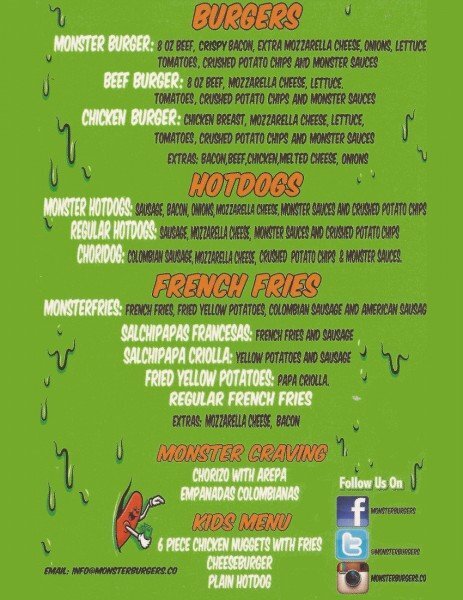 How is it possible that I’ve overlooked this each time I’ve eaten from the Monster Burgers Food Truck? Well, that settles what I’m having next time.